By Daniel Horowitz--Early last month, Ed Sonshine, Chief Executive Officer of RioCan Real Estate Investment Trust and a renowned leader of Toronto’s Jewish community, got an unexpected phone call. On the other end of the line was the voice of Gord Nixon, President and CEO, Royal Bank of Canada, informing Mr. Sonshine that he had just been named Canada’s Outstanding CEO of the Year. “I knew that I had been nominated by somebody, but I quite frankly paid no further attention to it, because this award usually goes to some giant company,” says Mr. Sonshine. Some would argue that RioCan REIT, which, under Mr. Sonshine’s consummate leadership owns and manages Canada’s largest collection of shopping centres and has evolved into the country’s largest real estate investment trust with an enterprise value of approximately $14-billion, qualifies as “giant”. “I didn’t take it seriously that I had a chance; I just thought it was nice to have been nominated,” he says. Unlike Mr. Sonshine, Fred Waks, RioCan’s President and Chief Operating Officer, was not surprised by the honour bestowed on his friend and partner. “Ed is a great mentor who leads by example; and everything he does, I, and others at RioCan aspire to do,” says Mr. Waks. 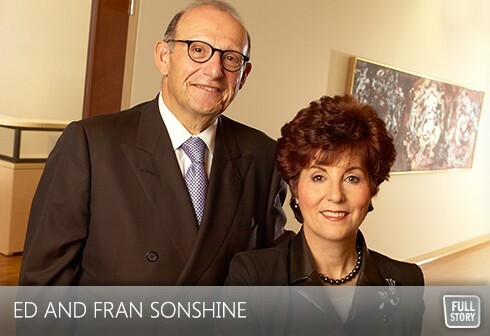 For those counting, Mr. Sonshine is the second Jewish CEO to be awarded with this prestigious honour, following in the footsteps of The Four Seasons Founder, Isadore “Issy” Sharp, who was named in 1992. "Ed was chosen because he has done a remarkable job building, growing and leading one of Canada's largest and most successful real estate companies and because he is universally admired and respected as an individual and community builder,” says Mr. Nixon. “The fact that he is so well liked by everyone is just icing on the cake." And despite the acclaim, Sonshine is quick to point out that he is only as good as his employees. “This is very much a team award,” says Mr. Sonshine. Despite his success, as a Jew born to Holocaust survivors in a Displaced Persons Camp in Bergen Belsen, Mr. Sonshine often felt like an outsider in the business world. And Mr. Sonshine has also had a strong impact, not only in business, but on Toronto’s Jewish community. He, like wife Fran, is a Past Chair of UJA of Greater Toronto’s Annual Campaign, and he continues to play a a vital role with UJA and other important Jewish charities across the GTA as a generous philanthropist and volunteer. “There are a lot of vital Jewish organizations in this community, but there is only one that encompasses 100 partner agencies, and that is UJA,” says Mr. Sonshine. “Ed's leadership inside and outside the Boardroom has inspired a new generation of community builders to dream more and do more,” said Ted Sokolsky, President & CEO, UJA Federation of Greater Toronto. And, yes, as the old adage proclaims, behind every great man there is a great woman. “Fran has been the perfect mate in every way,” says Sonshine.